Denton County Transportation Authority (DCTA), in collaboration with Ford Smart Mobility microtransit technology provider, TransLoc, has launched a pilot program for free mictrostransit service: Denton Enterprise Airport On-Demand. The pilot launched on August 27 and is scheduled to end on January 14, 2019. Through this program, on-demand rides are available within the designated Denton Enterprise Airport Zone. 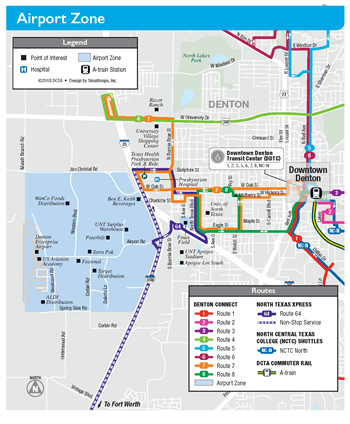 Rides can also be taken to/from the University of North Texas (UNT) Fouts Field and other DCTA services. Rides can be booked through TransLoc’s Microtransit app Monday through Friday from 6am to 9:30pm and Saturdays from 8:30am to 7pm. The pilot aims to provide an innovative and affordable mobility option.